In 1970 all the efforts of the councils to stop cars parking on the refurbished Market Place were put in jeopardy. A hamburger vendor convinced local magistrates that the Market Place was partly a highway. 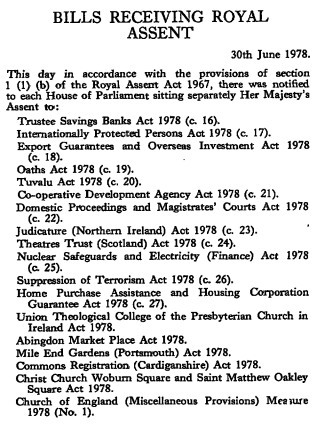 A few years later a private bill was given Royal assent in June 1978. 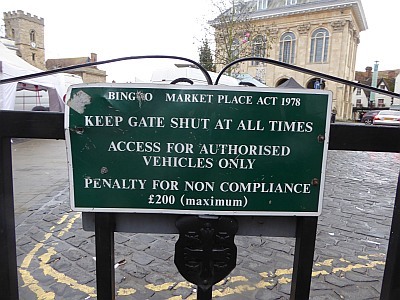 Sponsored by the Vale of White Horse District Council, and Abingdon Town Council, it allowed the Town Council to lock the gate and legally control what vehicles are allowed on the Market Place. 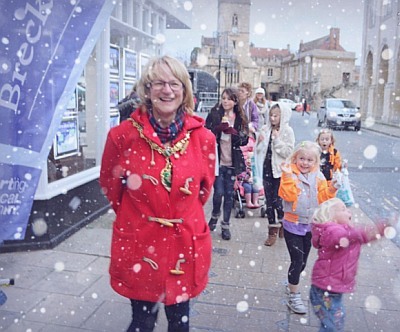 The Christmas Extravaganza,organised by Abingdon on Thames Chamber of Commerce, took place in Abingdon today. There were stalls all along Bath Street, and entertainment on the Market Place. 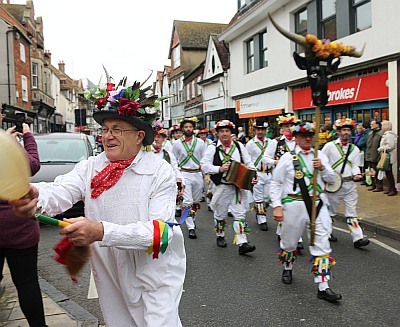 and Abingdon Traditional Morris Dancers. and Father Christmas, who spent the rest of the day meeting children. 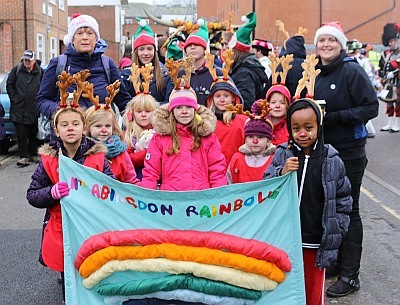 I did hear that there had been snow among the fine rain at the end of the parade, but later saw a snow machine at Breckon and Breckon, so it could have been that. 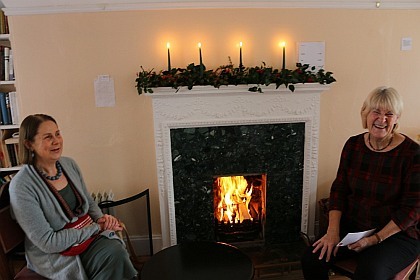 Elsewhere in Abingdon town centre, there was a Fairtrade and Craft Fair in the warmth of St Ethelwolds house; and entertainment and a jumble sale at St Nicolas Church. 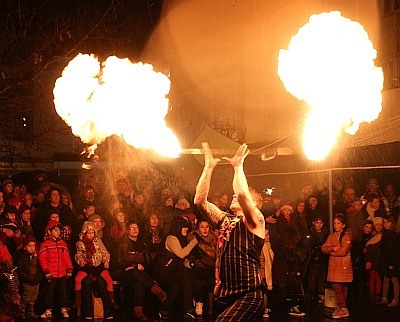 At the end of the afternoon the crowds gathered in the Market Place, despite the rain, to listen to the Community Choir then watch fire jugglers. 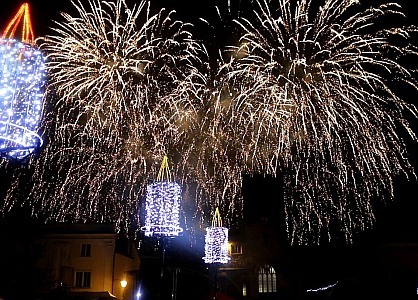 The Christmas Lights were turned on at 5:30pm, followed by some amazing fireworks. P.S. 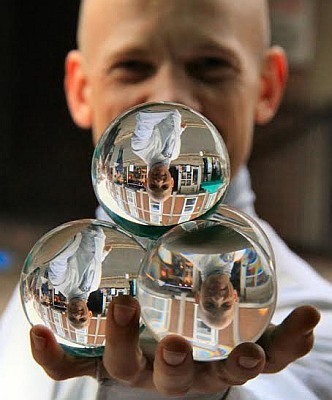 Thanks to Steve for sending me the picture of one of the entertainers. 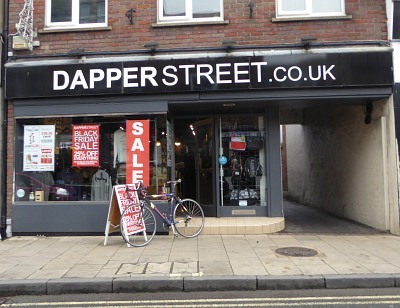 There were Black Friday sales in some shops in Abingdon today, particularly the clothes shops. 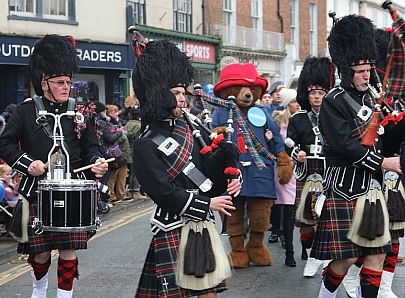 The town felt busier than usual at Friday lunchtime. However more people probably took part in the online sales. That will mean more trucks bringing goods to people in the days ahead. 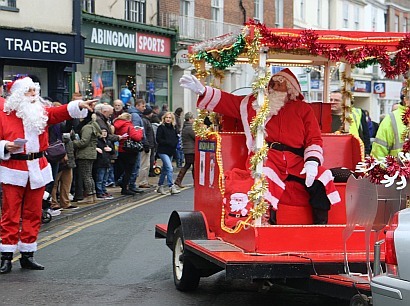 Saturday sees the Christmas Extravaganza, a real chance to buy locally. The parade is at 12:00. Lights get switched on at 5:30. 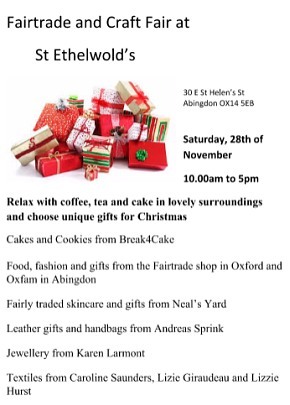 There is lots more going on, including a Fairtrade and Craft Fair at St Ethlewolds. Thanks to Gordon for this. 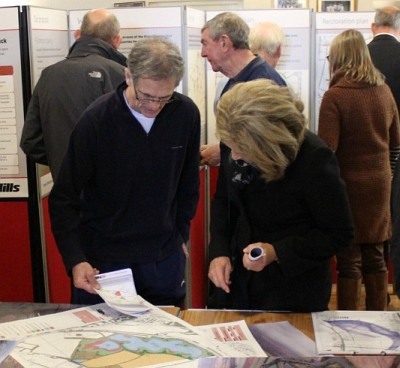 There was a public exhibition yesterday at Abingdon Vale Cricket Club for a proposed sand and gravel quarry on farmland between the River Thames and the A415. The entrance would be opposite the Culham Science Park. A larger scheme for the same site was opposed by residents, and opposed by English Heritage who did not want the bronze age cemetery at Fullamoor Farm to be destroyed. And so the proposed quarry area has been reduced in size, and traffic across the Culham and Clifton Hampden bridges removed. Lansbrough Estate moved from West St Helen Street to Ock Street, and Natural Health moved to Coxeter House. 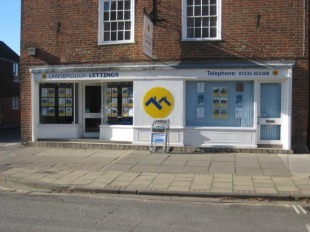 The vacated building was reconfigured: upstairs was converted to accommodation, and a new shop front was added. 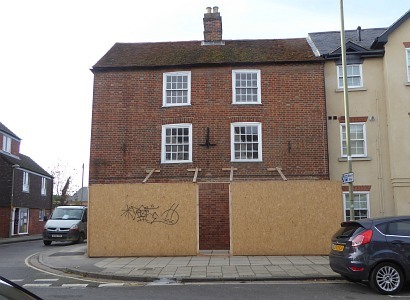 Two years later the shop front has been bricked up, and two smaller windows fitted.